Many engineering teams are currently engaged in mobile development and because of this, mobile user trends are very important to keep track of so that each of us ends up building the right mobile applications today and hopefully as far into "tomorrow" as possible. Trends are shifting quickly as new users enter the smartphone market, decide to switch devices or simply change their overall mobile behaviour. 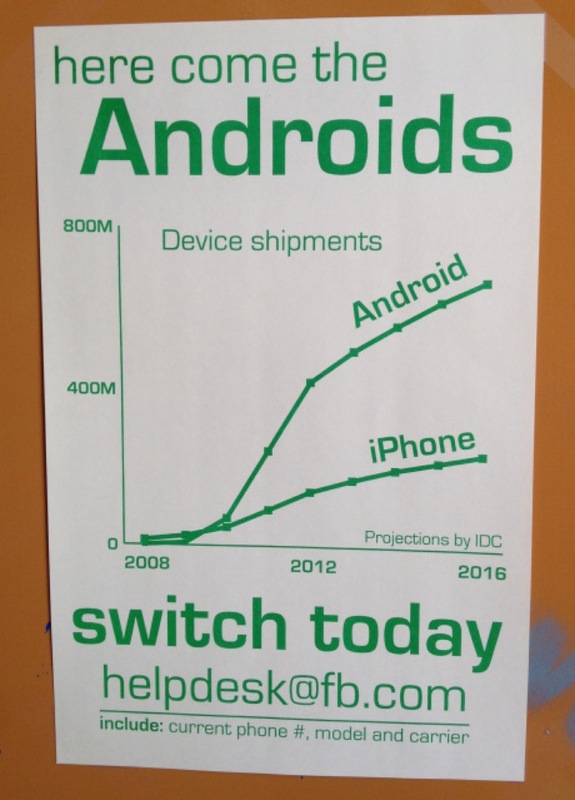 Facebook's poster (or really the IDC) is projecting quite far into the future as the date when this poster was mostly likely seen was around November 2012 (which puts us somewhere in the middle of the graph). The projection spans approximately 3 years from today till somewhere in 2016. In the technology business that's a very very long time to project anything as few people really know what will happen in 1 year from now let alone 3 (the iPhone 3GS was released just over 3 years ago and now look where we are with Android phones dominating). Maybe Windows Phone, the forthcoming Firefox OS or even a yet unnamed player will be lucky enough to steal some market from Google or Apple but really only time will tell. All I know right now is that the competition among these tech giants is fierce and as a result its producing an upward spiral of innovation within the smartphone market which all of us will benefit from for years to come. 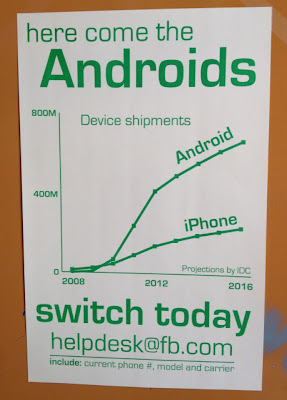 The really interesting nugget of information within that Facebook poster projection is the dominating trend that Android currently has over iPhone and looks to have and increase in the months/years to come. If you or your company is still solely focused on iOS development at this point it may be worth reconsidering where the bulk of your customers are today let alone tomorrow. There was much talk way back when about Open vs. Closed Platforms and many predicted that even with Apple's initial dominance Android's "open system" would eventually prevail and it looks like that prediction is happening in full force (for the foreseeable future at least). For an even deeper analysis of various Internet and mobile trends, Mary Meeker's year end trend report is an absolute gold mine of information. 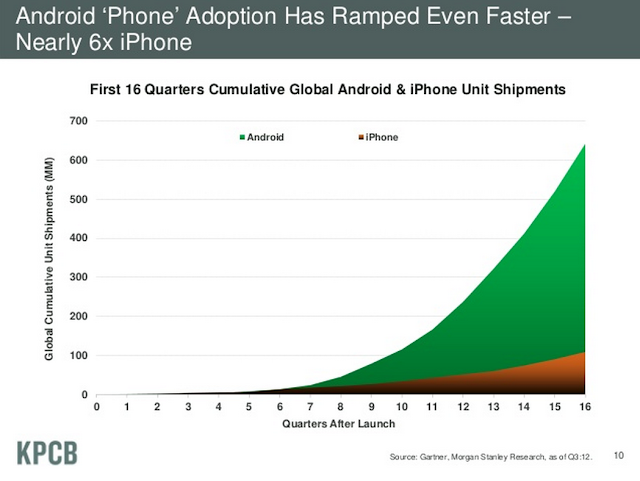 I've included a screenshot of slide #16 below where she notes that Android phone adoption was nearly 6x that of the iPhone... WOW. "Don’t build an app based on your website. 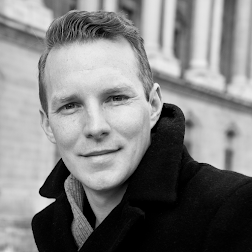 Build the app that acts as if websites never existed in the first place. Build the app for the person who has never used a desktop computer. Because they’re coming. Soon." "What matters is that in the next five years every person on this planet is going to be using a mobile device. And these devices are going to be used far more than any traditional computer ever has been and ever will be." So whether you're building mobile applications with HTML5 or going native, make sure to build the right experience for that specific mobile form factor instead of replicating or mimicking what you've previously built for the desktop. Following on from MG Siegler's article above, here is an interview with Vibhu Norby on TechCrunch TV who disagrees that Mobile is unanimously the future of all development. "mobile is not an evolution this is a revolution." "every human activity is being re-imagined through the prism of a mobile device"
She went on to say that the 3 areas of mobile development that are seeing huge potential are: Education, Consumer Health and the Internet of Things. Another Mobile Internet assessment from Business Insider called "The Future of Mobile".